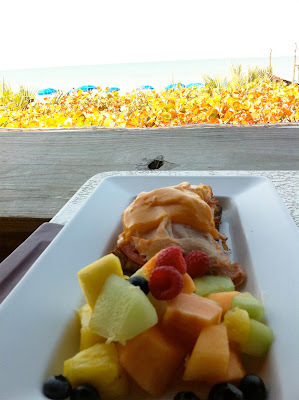 Welcome to a distant view of the Gulf from the perspective of our lunch at the Ritz Carlton's Vanderbilt Beach bistro, Gumbo Limbo. This year's dining experiences in the Naples area have been more impressive and memorable than in years gone by, and for good reason. The economic climate of the times dictates that anyone who's serious about riding out the downturn has to up their game. Impeccable service, fresh ingredients, beautiful presentation and creativity in the kitchen and menu like never before. Here's my list of winners and 'pro shows' who have performed consistently throughout the winter of 2011. Blue Sushi. I suspect I will be adding to this list as I recall noteworthy experiences that just aren't on our radar this season. Cheers et bon appetite! So yummy colorful and the smell of spring!!! This makes me want to be back to my island PR! Hello hon, it was lovely visiting your blog! This makes me very hungry!!! Tomorrow is grocery day and you have inspired me to buy more fresh fruit and all my faves!!! !